Terrell Owens is in a movie. 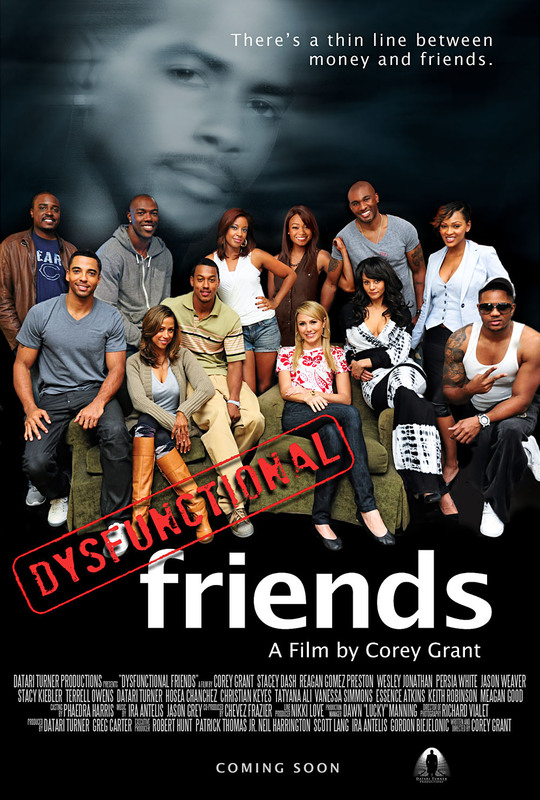 The movie is called Dysfunctional Friends. Before we critique Terrell’s acting prowess, a few important facts about the film. Jozen Cummings: After their very wealthy friend dies unexpectedly, a formerly tight-knit group of college buddies reunite at the funeral, only to learn each of them are entitled to a piece of the fortune. The one catch: They must spend five days together in their fallen friend’s house. With the exception of Stacy Keibler, all of the friends are Black, thus making it too easy to jokingly title this movie Big Brotha. Rembert Browne: I had no idea this was the plot. I’ve got to do better. Cummings: For fans of actors who are either currently BET-famous or were famous back in the ’90s, check out this dream team of an ensemble cast: Stacey Dash (Clueless! ), Reagan Gomez-Preston (The Parent ‘Hood! ), Jason Weaver (Drumline! ATL! ), Wesley Jonathan (City Guys!! ), Tatyana Ali (The Fresh Prince of Bel-Air! ), Hosea Chanchez (The Game! ), Persia White (Girlfriends! ), Meagan Good (Cousin Skeeter! ), Stacy Keibler (WWE! ), and the man who has given us the reason to write this article today, Terrell Owens (The T.O. Show!). Browne: The fact that you didn’t bring up Smart Guy when discussing all things “Jason Weaver” is upsetting to me. Cummings: The film opened in theaters this past weekend under the AMC Independent umbrella, which means if it is playing in a theater near you, it’s given one screen. At the showing I went to early Saturday evening, opening weekend, there were just as many people in the theater as there were people at Terrell Owens’ last workout. Browne: My viewing, in the same theater the following day, started off with seven people, but ended with five. There really is nothing like getting in a good push-up/sit-up/wind sprint set right in the aisle, midmovie. Cummings: If ever there were a role written with Owens in mind, it’s his role as Jackson, the fiancé of Lisa (played by Dash). Jackson is a professional basketball journeyman who gets traded from Miami to Toronto and, before even dribbling a ball in Canada, then gets traded to Milwaukee. Switch out basketball for football, and you get a classic case of art imitating life. Browne: Wow, I didn’t even think of that. Then again, I thought the plot of the movie was a documentary about thirtysomething Black actors who were currently in the witness protection program. So yeah. Wow. Cummings: Despite gorgeous women, Jason Weaver one-liners (someone get that man a show, again), and a semiretired athlete trying to show he can be the next Jim Brown, it still wasn’t enough to make Dysfunctional Friends a film worth sitting through. Although the “Introducing …” tag Owens was given in the opening credits (a touch that seems to be required for whenever athletes and rappers want to be taken seriously as actors) was awkward, Terrell Owens wasn’t the worst thing about this movie, nor was he worse than he was as a VH1 celebreality character. Hollywood, get the popcorn ready, put a bunch of other capable actors around him, and watch T.O. do his thing. Browne: This was the perfect first role for T.O., because he outperformed some of his costars, who have spent their entire lives “acting.” Obviously, he doesn’t hold a candle to Jamal from City Guys, but that’s talent you can’t be taught. You’re born with Jamal from City Guys-esque talent. Anyway, if you have a free afternoon and can round up a bunch of friends, throw a party at a theater showing Dysfunctional Friends. I guarantee your group will make up 97 percent of the room and after the drinking game really gets underway, those last few people that were in the theater will either leave or join in on the fun. Jozen Cummings (@jozenc) is a writer living in New York City.